With the end of the year steadily approaching, some consumers may already be thinking about their New Year’s resolutions. Unfortunately, if you – like many others – will be making the pledge to drop a few pounds, putting up a new calendar won’t make it any easier. There are plenty of reasons why someone may fail in their weight-loss goal. Going out and getting exercise can be like pulling teeth for some people, and starting a new, healthier diet can leave others still feeling hungry. Luckily, researchers at the University of Copenhagen’s Department of Nutrition, Exercise and Sports may have a remedy for the latter problem. Professor Anne Raben and her colleagues have conducted a study and found that meals that include beans and peas can be more satiating than those based on meats like veal, pork, or beef. They say that making this dietary change could lead to greater weight loss because consumers won’t feel the need to eat as much. Many dietary recommendations currently favor diets rich in protein to solve the problem of feeling hungry. That usually means eating more meat, but the researchers say that certain legumes can do the trick just as well. They conducted a study in which 43 young, male participants were served three different meals consisting of patties; each was made up of either beans and peas or veal and pork. The researchers measured how much food was eaten to satisfy hunger and how much food was eaten at the next meal as an indication of satiety. The findings showed that the patties made from beans and peas could satisfy the hunger of participants just as well as patties made from meat. Further, participants consumed 12% fewer calories in their next meal when eating legumes compared to meals after eating meat. The researchers believe that fiber content may have been the key. "The protein-rich meal composed of legumes contained significantly more fiber than the protein-rich meal of pork and veal, which probably contributed to the increased feeling of satiety," said Raben. 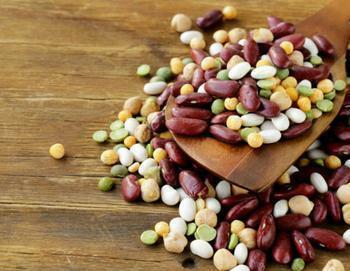 The researchers believe that dieting consumers would benefit from adding more legumes to their diets as opposed to meat. Raben admits that this notion against consuming larger amounts of protein goes against the norm. "[The research] is somewhat contrary to the widespread belief that one ought to consume a large amount of protein because it increases satiety more. Now, something suggests that one can eat a fiber-rich meal, with less protein, and achieve the same sensation of fullness." "While more studies are needed for a definitive proof, it appears as if vegetable-based meals -- particularly those based on beans and peas -- both can serve as a long-term basis for weight loss and as a sustainable eating habits,” she said. The full study has been published in Food & Nutrition Research.